Talk about turning it around. 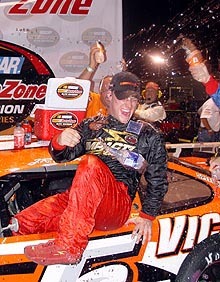 To start out the 2005 season, JR Norris, the 2004 NASCAR Southeast Series Rookie of the Year and preseason favorite for the 2005 series title, had finishes of 20th and 18th. It was not the start that he or anyone associated with the Richie Wauters-owned team wanted. The last month - that is what the team had in mind all year long. Norris dominated Saturday night’s 150-lap event at Greenville-Pickens Speedway, marking his third win of the year and his second-straight, dating back to his dominating win at Caraway Speedway (where he led every lap) of just a few weeks ago. The win also vaulted Norris to a comfortable points lead following such a horrible start to his year. In fact, it looks like Norris is suddenly the man to beat and he’s mighty fine with that. Heading into Saturday night, the man to beat was surely Jeff Fultz. Fultz had won the last four Greenville races and followed that up by capturing the pole for Saturday night, followed closely by Norris. Fultz pulled a 10-pill, putting himself and Norris in the fifth row at the start. Both made quick work of the field, working their way toward the front before the first and only round of pit stops just after a lap 25 caution. 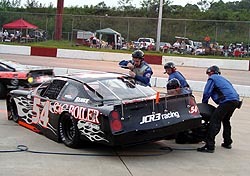 The Southeast Series teams have always been required to stop at Greenville, but this time around, they were required to change one tire as well. The flurry in the pits put Kevin Prince out first, but Gary Helton held the lead while not pitting with the rest of the leaders. “What a long night,” said Fultz, who was able to make it back up to third by the end of the race. “We had a good car. We just cut the left rear down for some reason. We were fortunate enough to get in and get a new one on it, but we didn’t get it set. We weren’t really ready to put it on. The air pressure was too high and that made the car not handle right. No one had a thing for Norris though. He grabbed the lead on lap 57 and never looked back. second place Justin Wakefield anyway. He was too far ahead. “We worked on this thing and tried to make it better all day,” said Norris. “We tried this and tried that. We felt like we had a pretty good car. Right at the last minute, before we qualified, we changed a couple more things and the car came alive. “I just can’t believe I won here,” said Norris after Saturday night’s dominating win at Greenville. “I can’t even put into words what this means to me. I really can’t describe it. This is a place I’ve struggled so much at. I can honestly say I never expected to win at a legendary track like Greenville-Pickens. Now if I can just go win at Nashville (Music City Motorplex), it will make up for everything. “I can’t believe this thing was as awesome as it was tonight. My hat's off to all my guys. It was the best the car has ever qualified and the best the car has ever felt. In the race, I just tried to bide my time. Fultzy got down in front of me and I just decided to follow him. I knew he was going to the front. Then he had a flat tire, I got up front and we just cruised from there. Jeff Fultz had to pit more than everyone else to change a flat tire. Prince, Helton and others proved no match for Norris and Fultz, who each worked their way back toward the front. However, during another caution period, Fultz’s #54 made an unscheduled pit stop with a flat tire. The team got it changed and got him back out, but having to come from the back the pack yet again ruined his shot at the win. For Wakefield, it was his second-straight second-place finish at Greenville. 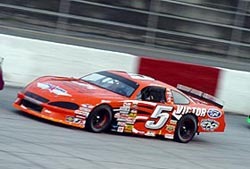 Helton came back through the field after a late pit stop to grab fourth, while Jason Hogan came home a strong fifth. 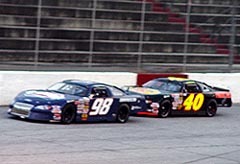 Justin Wakefield (#98) finished second at Greenville for the second time this year.